Work has been bringing me all over the country lately, which is great, but it also means being away from home for stretches of days at a time. Eugene is generally pretty good about sorting out meals while I'm gone, but I do like to try and make it a little bit easier by leaving a few simple things behind that he can easily heat up or at least use as the base for several meals. 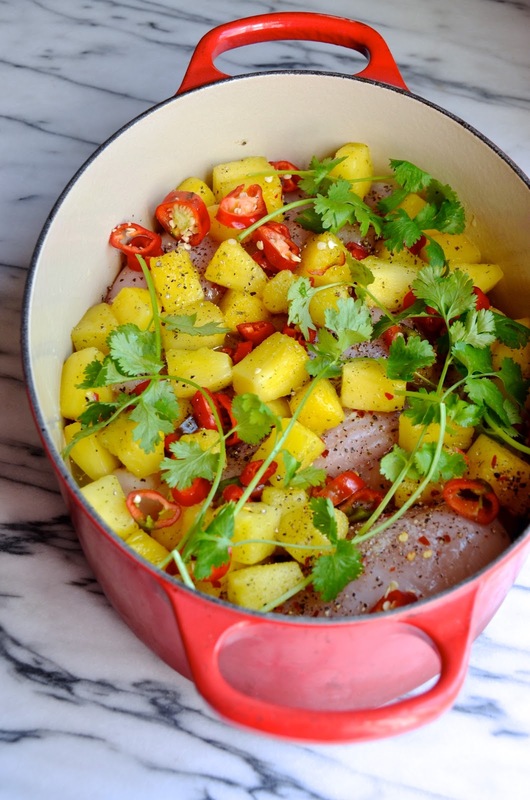 Last week I left him a pot of this very easy One-Pot Spicy Pineapple Salsa Chicken, which I literally threw together in about 10 minutes the morning I left town. It's one of those "everything goes in the pot" kind of recipes, which I appreciate even on the days when I'm home and have time to work on things. 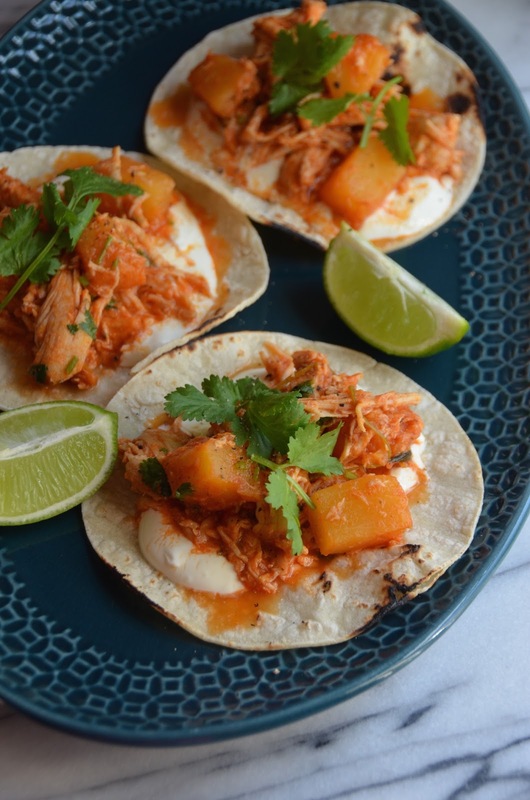 This sweet and spicy recipe produces a large quantity of tender, flavorful pulled chicken that can be used to make tacos (my favorite!) or sandwiches (so good on soft rolls), or served as-is with rice or your favorite vegetable side. 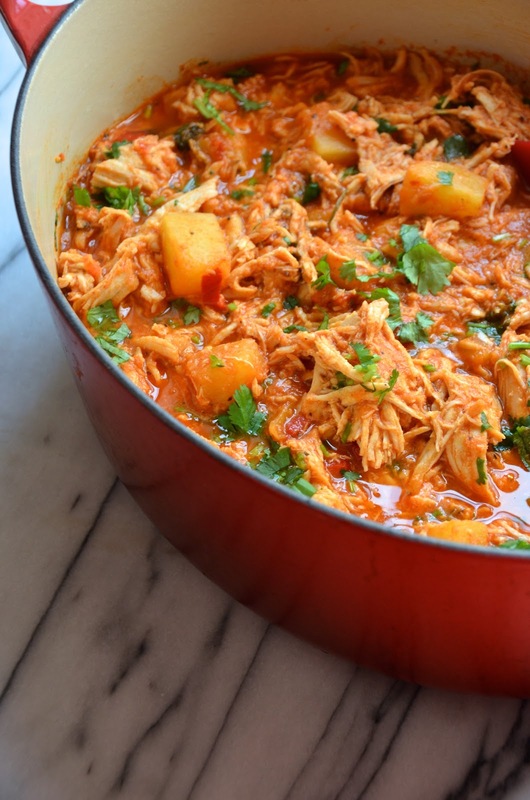 Place a heavy pot or dutch oven over medium heat. Coat the bottom with olive oil. Nestle the chicken in a single layer at the bottom of the pot. Season generously with kosher salt and black pepper. Add the pineapple, sliced jalapeños, smoked paprika, cumin, garlic, chopped cilantro, crushed tomatoes, lime juice and broth to the pot. Stir to combine. Raise heat and bring to a boil, then lower heat, cover, and let simmer for 1 hour. Remove top, and use a fork to break up chicken. Let simmer uncovered another 20 minutes until sauce thickens. Serve with warmed tortillas and your favorite toppings.